Anthony Zacharzewski @demsoc also writes on local government. He runs the Democratic Society, which works to support participation and citizenship, but writes here in a personal capacity. In a previous life, he was a senior officer in both local and central government. He lives in Brighton. The coalition programme announced today sticks to Conservative manifesto pledges on Sure Start, but misses an opportunity to explain the “Big Society” idea. 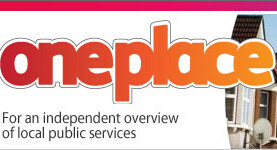 Today’s launch of the OnePlace local public services website increases democratic accountability. It brings together reports of local public service regulators.